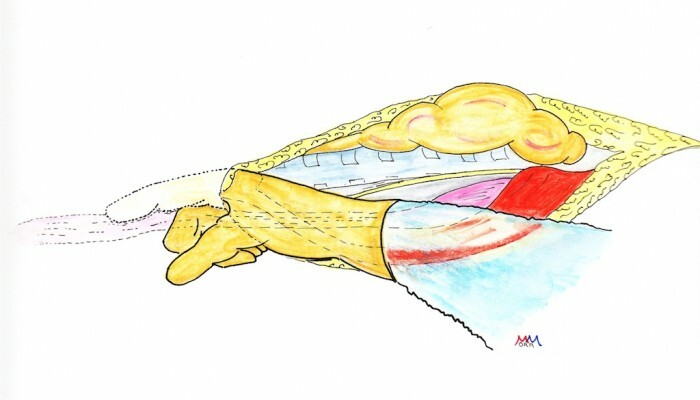 The cervical and abdominal incisions. 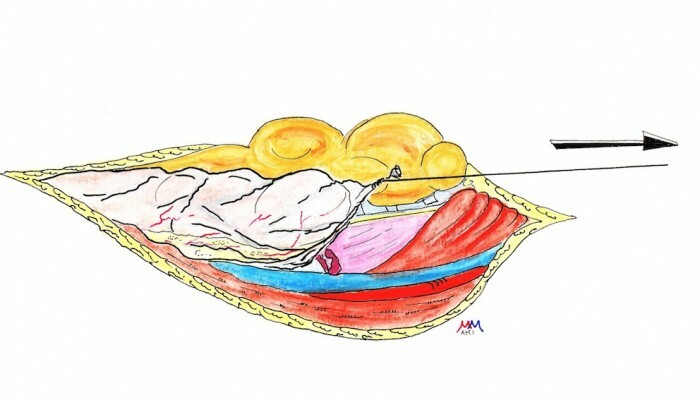 The mobilization of the stomach starts at the lower part of the greater omentum. The latter is opened beyond the gastroepiploic arcade. The epiploic then the gastrosplenic vessels are ligated. 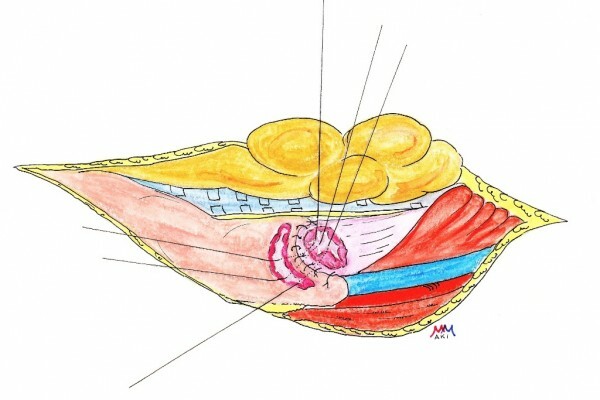 At that stage the left crus of the diaphragm can be sectioned. The right part of the greater omentum is opened unto the pylorus then the smaller omentum. 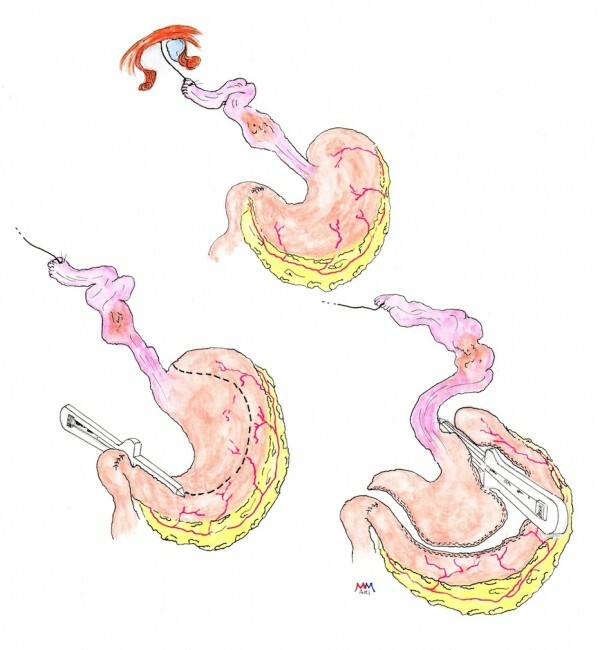 The posterior wall of the stomach is freed from adhesions with the pancreas and the right crus is cut. The esophageal hiatus is enlarged to 7-10 cm. The pericardium is gently pushed posteriorly and the left pleura laterally. The enlargement of the hiatus will discover the left and right pleurae and the pericardium anteriorly. A: The esophagus is pulled downwards. The lower mediastinal esophagus is dissected with its surrounding lymphatic tissue, the anterior vagus nerve is clipped and sectioned. B: The esophagus is the retracted upwards and the same dissection is carried out on the plane of the lower thoracic aorta. The posterior vagus is also interrupted. A: The retroperitoneum is cut in front of the right kidney. 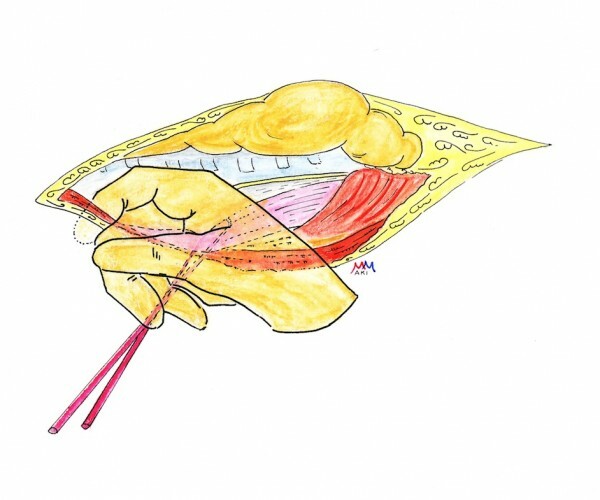 B: The duodenopancreatic block is elevated and can be held in the left hand. 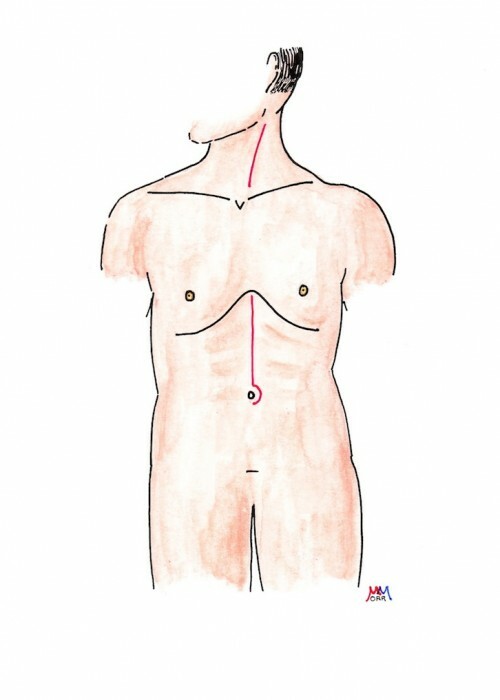 C: At the end of the maneuver the duodenum can be retracted on the left thus discovering the IVC and abdominal aorta. A: The left gastric artery is ligated at its origin from the celiac axis. B: At this stage the D2 lymphatic dissection can be carried out from the common hepatic artery to the celiac axis. The hepatic and splenic arteries are freed from any lymphatic content on the spine of the pancreas. The posterior limit of the dissection is the nervous celiac plexus. 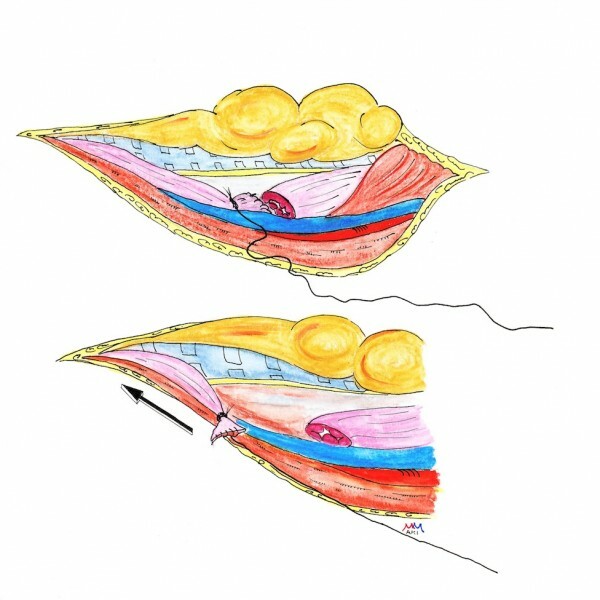 Pyloroplasty: The pylorus is sectioned longitudinally and sutured transversally with slow resorbing separated stitches. 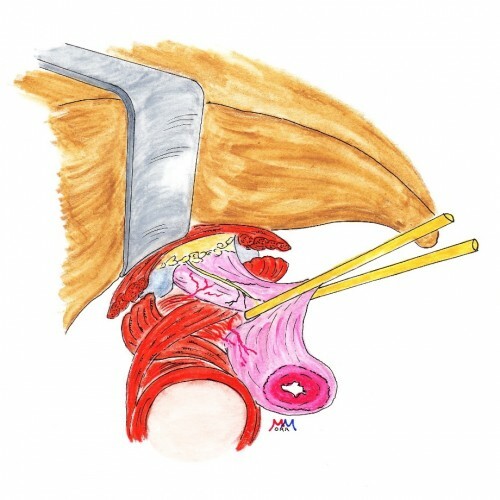 The cervical esophagus is approached by retracting laterally the sterno-cleido-mastoid muscle and jugular vein. The recurrent nerve follows the tracheo-esophageal groove and is carefully retracted by the of the assistant. The left thyroid lobe is anteriorly retracted. The cervical incision is performed on the left sternocleidomastoid muscle. The internal jugular vein is retracted laterally and the thyroid gland anteriorly. 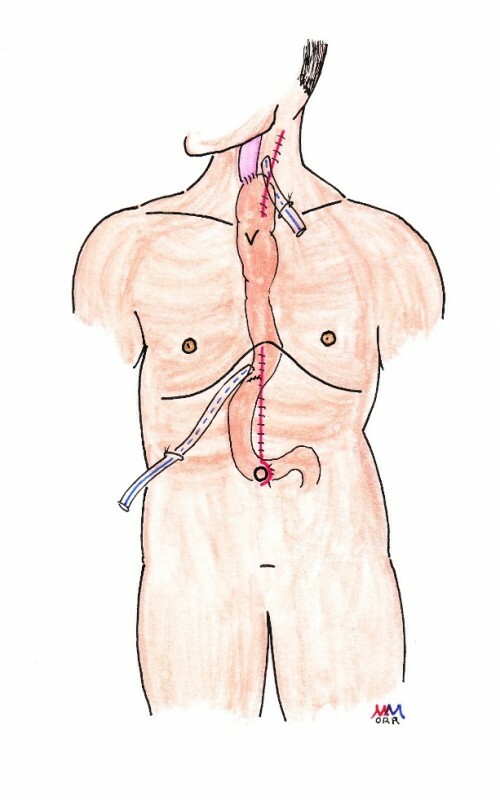 The esophagus is approached lateral to medial. The left recurrent nerve is dissected along its cervical passage. It must be protected during this step and retracted by the hand of the assistant and not with metallic retractor not to damage it. The esophagus encircled. The right recurrent nerve is not visible. So the dissection must stay as near the right wall of the esophagus as possible. The dissection is performed by the cervical finger between esophague and trachea as far as possible. 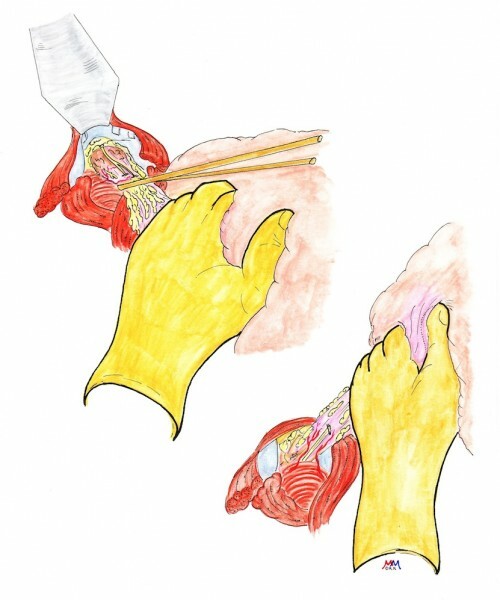 The bimanual dissection is completed by the abdominal and cervical hands. A: The cervical esophagus is cut. Its distal stump is closed and a strong and long threat is firmly sutured to this extremity. 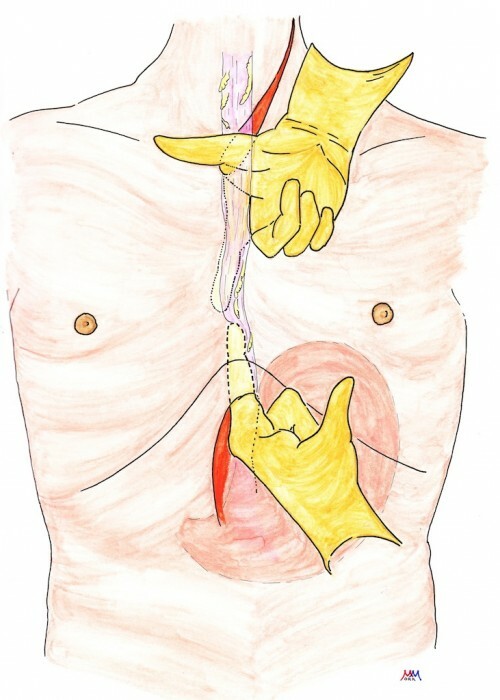 B: The abdominal hand pulls the abdominal esophagus. A: The esophagus is delivered in the peritoneal cavity. B: The smaller curvature is stapled from its angulus with the linear device. C: The stomach is tubulized along the greater curvature. Finally the esophagus and gastric body adjacent to the smaller curvature are separated. 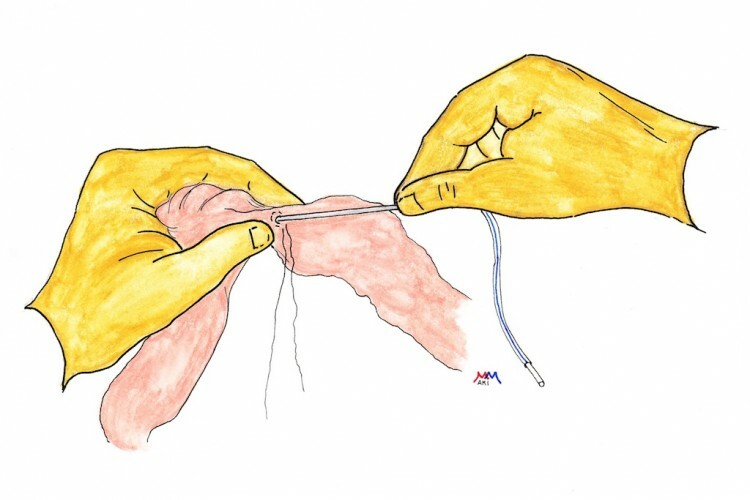 A: The gastric tube is placed in a wet plastic sheath. The strong threat that has followed the esophagus from the cervical to the abdominal incision is firmly attached to the sheath. 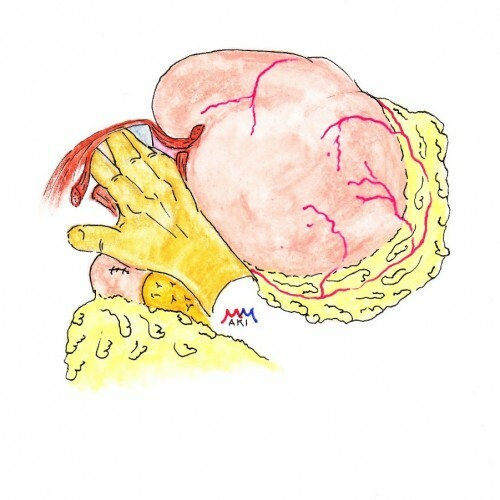 B: The left hand of the operator pushes the sheath towards the mediastinum while the right one pulls the strong threat. The sheath and gastric tube is delivered at the neck incision. Care must be taken to avoid a twisting of the tube when it ascends to the neck. 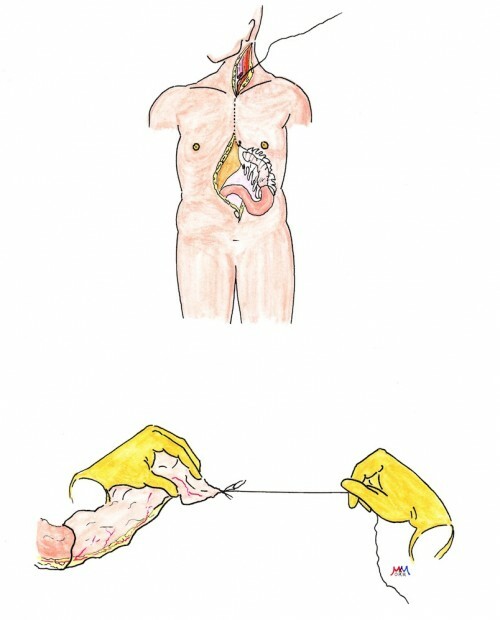 A good trick is to verify that the vascular gastroepiploic bundle in on the left part of the preparation. The sheath is removed from the neck incision. The vascularity of the tube is verified. 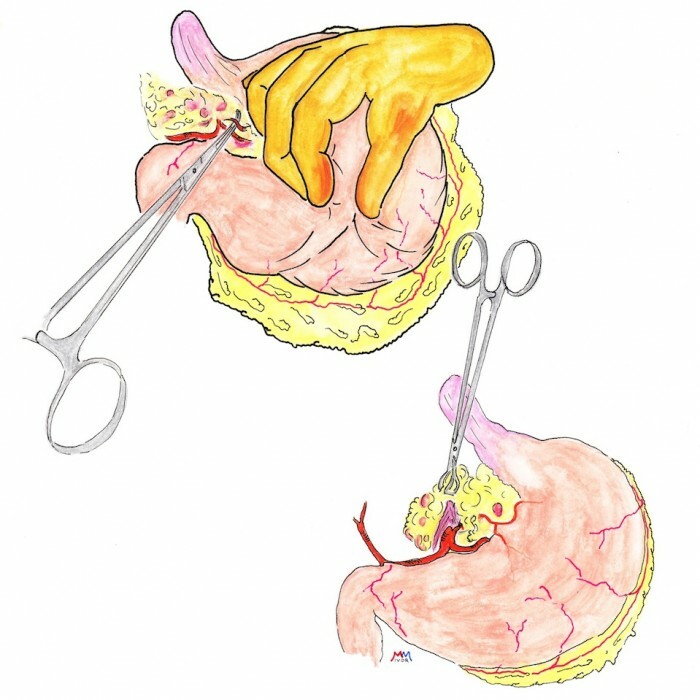 A gastrotomy adapted to the esophageal section is performed and the esogastric anastomosis is carried out in two planes of slow resorbing separated stitches. 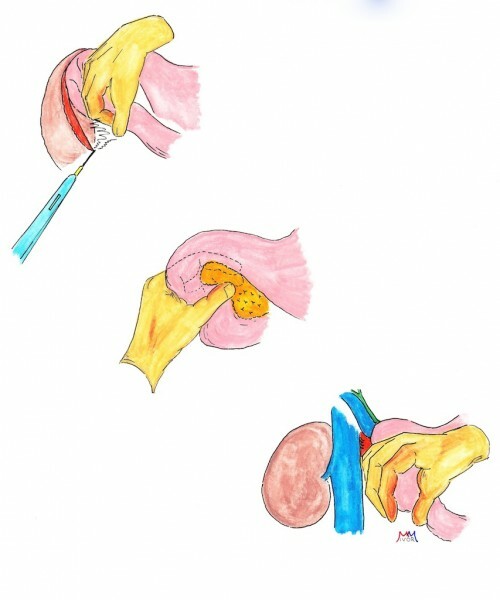 It is wise to place a percutaneous jejunostomy. 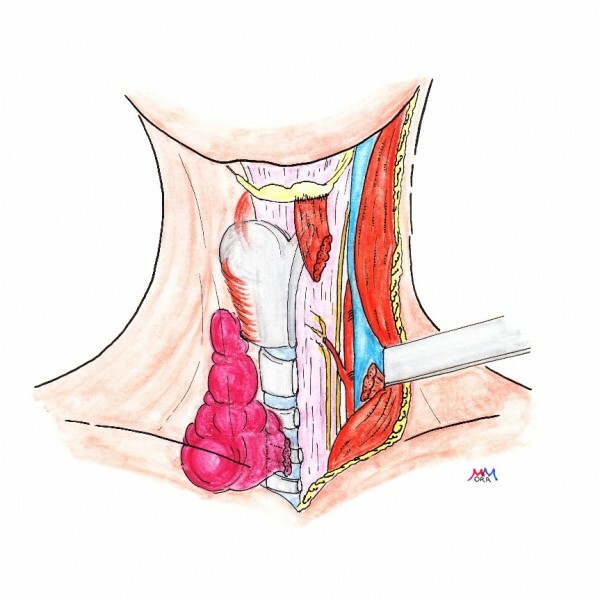 Closure of both cervical and abdominal incisions leaving a Jackson-Pratt drain at each level.